CKEditor formatting tools are available for teachers when scoring a Constructed Response item and when creating Items and Passages in the Work Space. For more information, please visit http://ckeditor.com/. The same text box and formatting tools are available in the Score Constructed Response screen and in the My Work Space, School Work Space, or District Work Space. Paste, Paste as Plain Text, Paste from Word: To support the conversion of documents to HTML, use one of the three options to copy and paste text into the text box. Create Equation: Create the equation by clicking on the numbers and symbols, along with those on your computer keyboard, then click OK to insert. Table: Click on the Table icon and complete the Table Properties set up. Click OK to insert. Use the Backspace key to delete the table. Insert Horizontal Line: Click in the text to indicate where the line should be inserted, then click on the icon. Use the backspace key to remove the line. 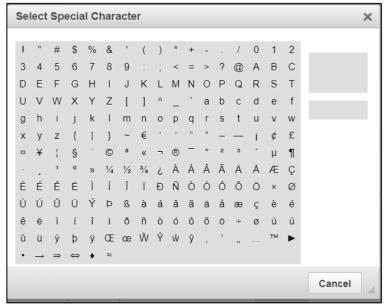 Insert Special Character: Insert special characters as needed, such as non-English language letters, by clicking on the omega icon. Source: Shows all coding from a pasted text. Remove coding as necessary. Click on the icon again to close. Insert Link: Name and paste a link you want to add to a question. Click OK to insert. Add Video and Add Audio: Drag and drop files to upload. Note supported file types in red. Click OK to insert. Strikethrough: Highlight the desired text and click on the icon to strike through. To undo, highlight the text and click on the icon again. Subscript, Superscript, and Remove Format: Highlight the text you want to format and click on the desired icon. Insert/Remove Numbered List and Insert/Remove Bulleted List: Highlight the text and click the icon to add and remove the desired formatting. Align/Justify text: Highlight text and align left, center, align right, or justify. Paragraph Format, Font Name, Font Size: Select your preference from the drop-down menus. Information: Character Maps: Go to the i icon in the Top Menu Bar, then click on Item Banks to view special character maps.